Susan has a hearing impairment and wears hearing aids in both ears. The hearing aids amplify sounds, especially those with higher frequencies. Susan wakes up in the morning with the aid of an alarm clock that has a vibrating pad under her pillow. Before she got this clock she was sleeping through the alarm because the sound was not loud enough to wake her up. The vibrating alert is also connected to the doorbell, the landline phone and the smoke alarm. A flashing light alerts her that someone is ringing the doorbell; it is probably the postman who has a parcel to deliver. The flashing light system is also connected to the landline phone and the smoke alarm, and flashes in a different way depending on the device that becomes active. Susan has read about a new system that uses QR codes or RFID tags on her front door and that can send a message to her mobile phone when somebody is at her door. The downside of the system is that it requires visitors to use their smartphone rather than pressing the doorbell. She looks forward to seeing this in use on a wider scale, since it would allow people to communicate with somebody at their door even when they are not at home. While eating breakfast, Susan turns on the television with the subtitles switched on to check the morning news. She also looks at the BBC news on her tablet computer but can only read the brief summaries because the video clips do not have captions. She can’t follow the radio news in the car on the way to work and feels left out when friends tell her about interesting programs; there are very few Radio 4 programs that have transcripts. She enjoys going to the cinema to watch films, but finds it frustrating that she needs to choose from the few dates and times when subtitles are shown. As a consequence, she sometimes goes to the cinema when her friends want to go and has to cope without subtitles. She has heard of a new app that shows subtitles on her mobile phone during the film. Hopefully, the cinema will get the necessary equipment soon. Even better would be glasses showing subtitles, because reading subtitles on a smartphone while watching a film is very uncomfortable. She finds places where really very loud music is playing easier to cope with, since nobody can hear well in those places, so everyone has to try and lip-read and use touch to get other people’s attention. 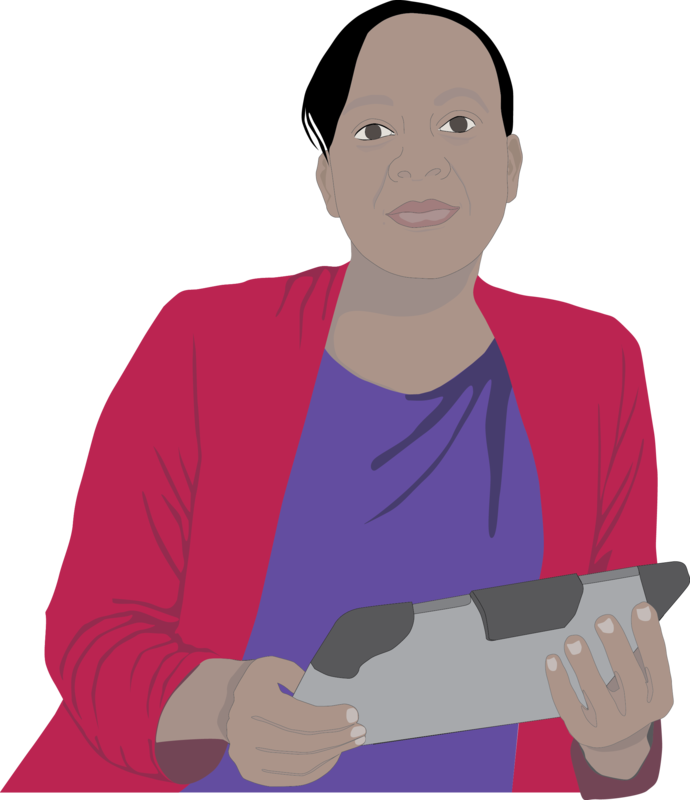 At work, Susan uses a text relay service for making business phone calls, although she prefers to text or e-mail using her mobile phone. When face to face with people at work in a quiet place she can understand the conversation quite well. She usually relies on her hearing aids and lip reading, but she sometimes tries using speech recognition on her mobile phone to help understand what people are saying to her. During meetings at work she sometimes finds it difficult to quickly identify who is talking and so often misses the beginning of what they are saying, especially when she can’t see their face and mouth. She occasionally uses a remote subtitling system. This system picks up the other person’s speech through a microphone and sends it to somebody who converts it into text (by typing or by speaking the words into a speech recognition system), which is then sent back to Susan’s tablet with a few seconds’ delay. She has also occasionally used a keyboard with a second screen for people to type messages to her. Her own speech is very intelligible, so she only types back when talking to another hearing-impaired person. At school, taking notes in class was difficult, since she could not hear easily what the teacher was saying. Classrooms were always very noisy with other kids creating so much background noise that she could not focus on one speaker. At university, she required a remote transcriber during lectures, which was very expensive but funded through the government Disabled Student Allowance. In face-to-face meetings with her tutor she generally coped well, thanks to her listening and lip-reading abilities. In seminars, it was difficult for the remote captioning to be able to hear well enough what the lecturer says, so there were lots of mistakes, which meant that Susan had to ask other students to repeat what had been said. See also the needs & preferences set for Susan. Text: © Copyright: The University of Southampton, 2015. The text is made available under a Creative Commons Attribution 4.0 International Licence (CC BY 4.0).